2nd place meets 4th place in this top of the table clash. Leicester is coming off of a loss to Klopp’s Liverpool while Manchester City won handedly on Boxing Day 4-1 in their last match. Despite Leicester’s impressive run in this underdog story everyone is loving, Manchester City was still considered the heavy favorites. LCFCs deep block and counterattacking strategy stifled MCFC and didn’t yield any results for themselves – resulting in the 0:0 scoreline. Surprisingly the Foxes started Inler as an extra midfielder rather than playing in their usual system with 2 strikers in a 4-4-2. Inler simply sat in front of the defense while the 4 in front of him shifted towards the ball. This inevitably left Vardy isolated up top and Manchester’s central defenders didn’t have a difficult time bypassing the forward pressing line. Both Kante and Drinkwater played as 8s intelligently in this system and would flexibly join Vardy in the front pressing line when he wouldn’t be able to pressure the other central defender in a high pressing sequence. This would form the 4-4-2 which we are more accustomed to in this squad and forced City into inaccurate long balls which were pressed well by Leicester. In regards to their offensive strategy – Leicester didn’t have much of the ball and looked to break mainly through the isolated Vardy (who made quick evasive movements towards the flanks so he can attack the goal diagonally) up front. They’d play simple combinations like a vertical pass into one of the central midfielders before laying off to one of the fullbacks like Fuchs to try and escape pressure and face forward – from this position they looked for long passes behind the defense for Vardy to run onto (instead of playing into his feet and letting him resist pressure to bring the rest of the team up the field). This was more easily intercepted by the City defenders as they could read the ball for a longer period of time due to the length of the pass and as Vardy was isolated they didn’t have a difficult time covering the space and attacking the pass (this changed in the second half though). LCFC’s main approach to buildup was to play long passes into the forwards (especially off of goalkicks). This is when Drinkwater or Kante would move forward and Mahrez would move very narrow – though this resulted in some dangerous counterattacks down the far side when City was able to escape this pressure. They did this to obviously press the long balls but also use their ability in tight combinations and dribbling (mainly Mahrez) to resist pressure and break through or play the ball onto the wing for a long diagonal. In the first half LCFC had 1 particularly nice moment where Fuchs was able to shield the ball from KDB and dribble towards the wing and play a long diagonal towards the far post where Vardy, Albrighton, and a central midfielder were attacking and nearly resulted in a goal. City played in their usual manner – with the two “wingers” vacating their positions and moving into the center and halfspaces as creators while the two fullbacks push high up the pitch (Kolarov even joined the forward line in most situations – where he consistently played long diagonals into the box without success). Silva was the one who most often dropped into midfield to help Toure and Fernandinho maintain possession and play into the forwards. Raheem Sterling began the match on the left flank but played as the right striker next to Aguero for most of the match. City had some problems due to the fullbacks pushing too high up too soon which isolated Fernandinho and Toure in the center without anywhere to play longer passes to escape pressure (when Silva wouldn’t drop). LCFC pressed quite well out of their midfield in their 4-1-4-1 and was able to win the ball off of the City central midfielders a few times due to this isolation. Though through this City structure they were able to connect in a few combinations which resulted in dangerous chances on goal. In one situation Sagna played a wall-pass into KDB in the halfspace and received the return pass once he had broken through the flank. This drew out a central defender and Sterling was able to attack the space in behind and nearly scored on a volley. City’s main threat in offense has always been their combinations on the flank to penetrate the box. When Kolarov moved to the left wing and Sagna occupied the right City were able to play with 4 players in central midfield. 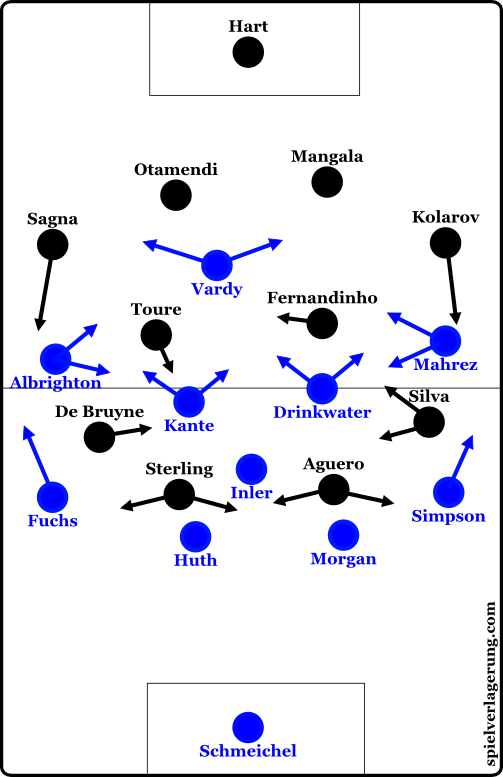 Aguero and Sterling remained as strikers while Silva and KDB moved into the halfspaces. Toure had some intelligent movement in moved into a #10 position here while Fernandinho remained as a six to form a diamond. In one situation this resulted in a vertical pass from Fernadinho into Silva who laid off to Toure. Toure immediately played the ball through the defense from this creative position to Kolarov. In one other situation KDB received a vertical pass in the halfspace and he flicked the ball to Sterling in the center as a lay-off pass who then played Sagna (who was already making a run during the vertical pass into KDB) and this resulted in another breakthrough of the defense. This type of speed, changing of structure, and anticipation is incredibly difficult to defend properly. In the second half there were a few minor changes that didn’t really impact the course of the game. Around the 61st minute Leicester subbed off Inler (who was struggling to keep the ball under pressure) and added another striker to move to a 4-4-2 (and 4-4-1-1 defensively). City subbed on Bony for Aguero and Navas for Silva (and they struggled in combinations a bit more due to this). The biggest and most valuable improvement in the second half for LCFC was that Vardy became much more involved in the combination play in transition to move his team towards the goal rather than simply making runs in behind and hoping the long balls broke through properly. The difference was immediately obvious as wingers now had an option for short diagonal passes into Vardy who would lay the ball off into Kante or Drinkwater moving up the field and now LCFC were able to attack City with a good field of vision and many runners ahead of the ball. LCFC had one of their best moments in the second half. Mahrez received the ball on the right flank and was being marked by Kolarov. When Drinkwater played him the pass he underlapped Mahrez, dragging his marker with him. Mahrez used that momentum and dribbled inside of the pitch into the cleared space (with the ball shielded far away from Kolarov). While this was happening Albrighton vacated the left flank and ran into the center and then made a diagonal run towards the front post from the center of the field. Because Mahrez had the proper position and field of vision he was able to play Albrighton through for a shot on goal. The final result of the game was fair given how both teams played. Neither team dominated but each had their dangerous chances on goal. They finish earning a point a piece as Leicester City move into 2nd place on goal difference behind Arsenal and City move into 3rd place (3 points behind the leaders and 1 point ahead of 4th). Leicester continue their underdog story and from my point of view as an analyst, they play consistently stable football which should result in them finishing out the season in a similar place on the table that they’ve achieved in the last game before the New Year. One things for sure, the Premier League title race looks like it will be exciting. Good analysis on a good match.